While looked for the online menu for this place, I finally realized why it sounded so familiar. There are apparently TWO New Wave Cafes in Philadelphia. I’m not talking about this one, folks. I’m talking about the Kensington-area (or was it Port Richmond? I get kind of lost up there) New Wave Cafe on Allegheny Avenue, just a few blocks from 95. Before we get any further, allow me to mention the alternative post title–New Wave Cafe or The Restaurant with the Worst Looking yet Best Tasting Food. That’s your warning. My pictures are pretty bad. In my defense, brown food doesn’t often translate well, but I will continue to share the images with that caveat. My friend, Amy, and I had a workshop at the Center for Grieving Children, Teens and Families (great place, by the way) in Port Richmond? Kensington? or something like that on Wednesday night. We planned to grab a bite to eat afterwards and I was on the hunt for a good place nearby. As I was playing on Yelp and Google Maps, my best options seemed to be places like “Golden Dragon Chinese” and “Sal’s Pizzeria.” I began to rethink our dinner date and wondered aloud what we could possibly do. See, Amy and I live in completely opposite areas and there was no real convenient place for us to go if we couldn’t stay close to the training. My co-worker, Larissa, mentioned that there was a great Polish place not too far from there. I looked it up online and discovered it was just a few minutes from the training and I was sold! After the training, we made our way back across Kensington Avenue and headed down Allegheny–Amy was following me and I was trying desperately to read my Google map directions in the dark. We finally passed the place on the right and it looked nothing like I would have expected. It seemed almost…shuttered? There was a bright white sign out front, but was otherwise indistinguishable. We couldn’t find a spot on Allegheny and I turned up the next little street. When we passed by the lady wandering aimlessly in her pajamas, I began to wonder if we made a mistake. Luckily, we made our way back onto Allegheny and quickly found two spots on the other side of the street. We slowly opened the dark and ominous door to an interesting scene. The place screams dive bar but has some cool sculptures on the wall and even a disco ball in back. Verrrry interesting. When we walked in, the folks at the bar paused from their Polish banter to look up at us. We were the only patrons sitting in the eating area and also happened to be the only non-Poles as well. The friendly bartender/waitress came over quickly with the menus and we were quite pleased. There was a short but comprehensive menu heavy on kielbasa, potato and cabbage. Yes! All of the menu items were listed in both English and Polish, including an option for “traditional” or “Hungarian” potato pancakes. For those who are interested, apparently Hungarian ones have some sauce sandwiched between the two pancakes. We were both drooling over the pierogies and decided to split an order of mushroom & cabbage ones to start. “Fried or steamed,” she asked us. “Fried,” of course, was the obvious answer. 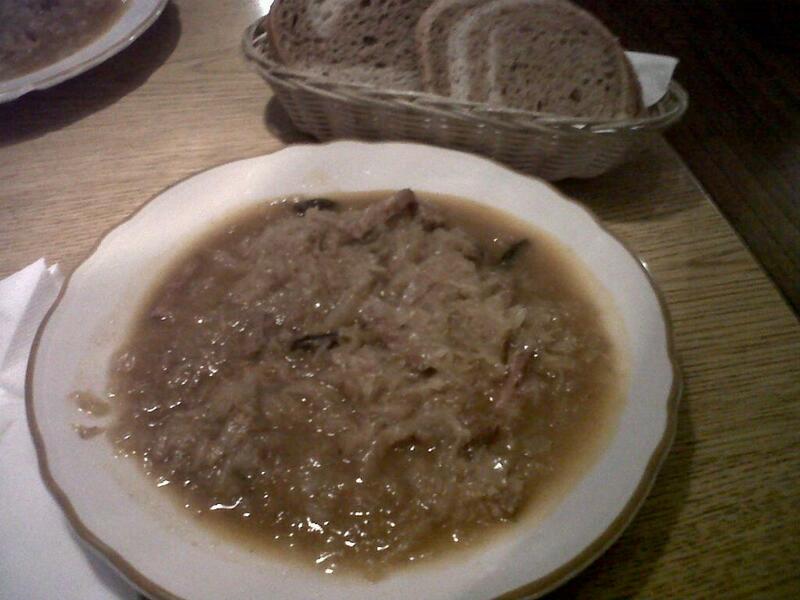 I also got an order of borsch (we call it borscht where I come from but Poland must have dropped the “t”) and we both went with the “Cabbage and Meat” as an entree, which is basically a stewed cabbage and kielbasa dish. The pierogies and my soup came out quickly. The pierogies arrived with a smattering of caramelized onions on the top. 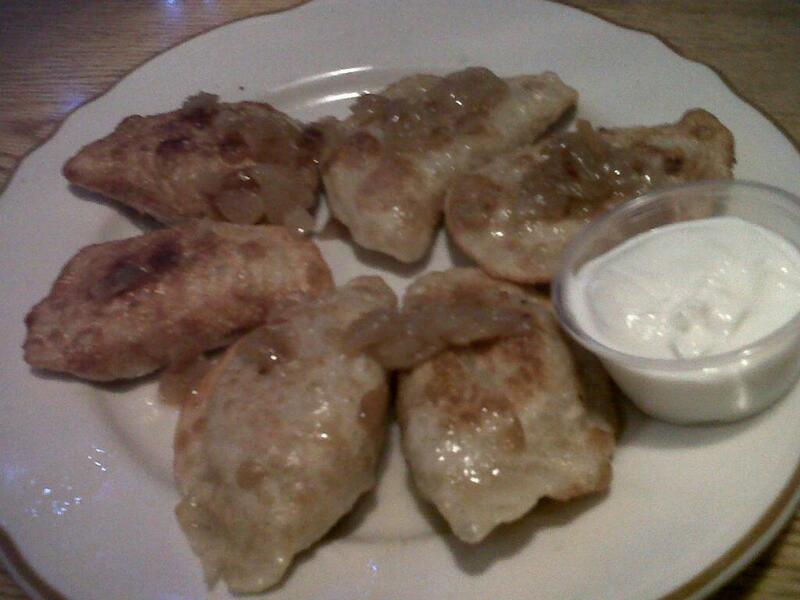 Wow, could you possibly make these pierogies even better? YUP, just add those onions! The pierogies were stuffed to the brim, although I didn’t notice the mushroom end of the promised mushrooms and cabbage. Don’t get me wrong, I was drawn in by the cabbage so nothing was missing in my book! They were fried lightly on the outside and tangy, cabbages pillows inside. My soup came out as well. I’m a little disappointed that the picture didn’t translate the hot pink color that we saw in person. Although I only wanted a cup-sized portion, all soups come in bowl orders only and for $3.00 that’s fine by me. As mentioned, the soup was a bright pinkish-red clouded with a clump of sour cream that had obviously already disintegrated into it and specked with chunks of beets, potato and dill. 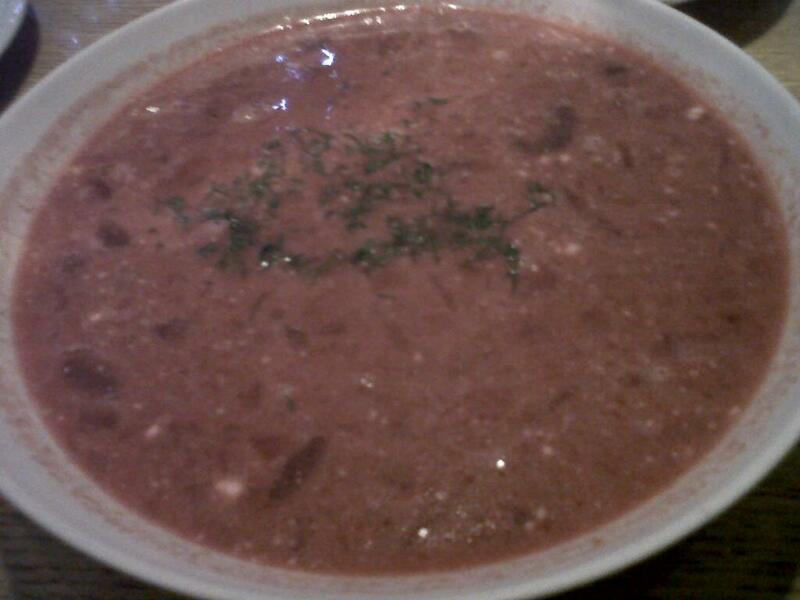 This borsch was lighter than other version I’ve had, with a clean, refreshing taste. My favorite part, of course, was when I got a surprise chunk of beet in my spoon! While we were still finishing up our appetizers, our cabbage entree came out. As we were preparing to leave, I headed to the ladies room. I was unbuckling my belt when I heard a loud banging on the door and an older woman’s voice saying “honey? honey? the bathroom!” I quickly redid my belt and was adjusting my shirt while she continued to pull on the doorknob (thank god I remembered to lock the door!) When I came out, this little Polish grandmother with an apron mentioned that the bathroom was broken. I started to say “I can just use the men’s…” but before I knew it, she was bending over, aggressively plunging the unassuming victim. Moments later, she stood up, flushed the toilet and said “all done,” before heading back into the kitchen. All I could think was I hope she washes her hands. Overall, New Wave Cafe was a great place to go for a break from the norm. Although it’s a bit of a hike from my house, its proximity to 95 makes it a welcome destination spot when I’m craving some hearty Polish fare. NB: they do NOT take credit cards, even though Yelp says they do. This created a near disaster for us until we could scramble together enough cash to pay the (very reasonable) bill. Hey Zoe – I’ve been enjoying following along with all your food exploits. I’ve been blogging for a couple years and recently spruced things up and moved to wordpress. I’m by no means a foodie, but I’m a total cinephile, and though I generally write about racing and travel, this month I decided to hold an Oscars-themed cook-off. Thought you might enjoy – http://havedentalflosswilltravel.com/2011/01/21/filmic-friday-the-countdown-begins/.